There is a phenomenon of incredible proportion currently happening in racing. The Epsom and Irish Derbies of 2016 were won by the Aga Khan’s brilliant colt Harzand, who is sired by Epsom Derby winner Sea The Stars. The colts who finished second to Harzand, Idaho in the Irish Derby and U.S. Ranger in the Epsom Derby, are both sired by another Epsom Derby winner in Galileo. Both of these sires are half brothers as they are out of the incredible broodmare Urban Sea. The ongoing legacy of Urban Sea’s family is fascinating to watch. She was a world class racer in her racing career and has become the undisputed Queen of the Turf in breeding from the later years of the twentieth century and into the new millennium. Urban Sea was bred in 1989 at Marystead Farm in Kentucky by Paul de Moussac and was consigned to the 1990 Deauville yearling sales. Hong Kong businessman David Tsui purchased her for 280,000 French Francs or approximately $50,000. Tsui operated a small stable in France under the watch of trainer Jean Lesbordes, and had his new acquisition sent to Lesbordes’ training centre. Urban Sea was sired by Miswaki, winner of the 1980 group one Prix de la Salamandre as a two year old. Miswaki won six of thirteen starts adding the Prix Yacowlef at two and Charles Hatton Stakes at three. Miswaki raced in France and England during his initial racing year, moving to the U.S. for his three year old season. Later he become one of the more influential sons of the great stallion Mr. Prospector. Miswaki developed a deserved reputation as a top sire of broodmares, leading the English/Irish list twice. The dam of Urban Sea is Allegretta, a group three stakes winning daughter of German sire Lombard. Allegretta also produced stakes winner Allez Les Trois by Riverman (who is the dam of stakes winners Anabaa Blue (Prix du Jockey Club), Reunite and Measured Tempo), as well as 2000 Guineas winner King’s Best by Kingmambo, another top quality sire by Mr. Prospector. King’s Best has sired Proclamation (Sussex Stakes) and Workforce (Epsom Derby and the Prix de l’Arc de Triomphe). Another daughter of Allegretta is Anzille by Plugged Nickle, who is the dam of stakes winners All Blade, Anzillero, All Pride and Always Awesome. Allegretta is considered by many as a foundation mare in her own right. Lombard was a major stakes winner in his home country winning twenty of twenty-eight races in his career, eighteen of which were stakes victories. Lombard has an interesting pedigree as he is devoid of any cross to Phalaris, which is hard to find in most pedigrees, and is a direct male line descendant of the Bend Or/Ormonde line which led to Tantieme, a two time winner of the Prix de l’Arc de Triomphe. 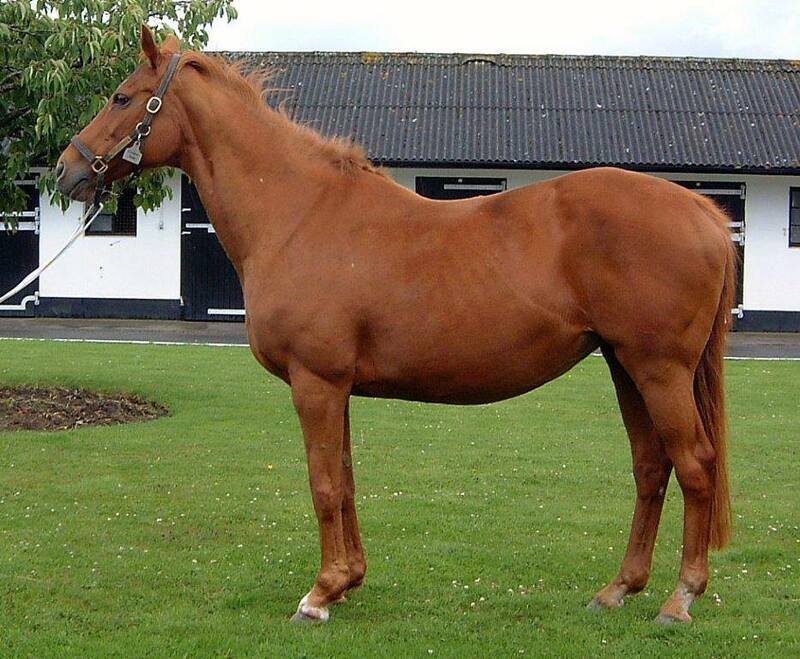 Tantieme is the grand sire of Lombard, through his German stakes winning son Agio. Urban Sea is one of the select few females to be a champion during her racing career and then become a champion broodmare, and is only the second mare to win the Prix de l’Arc de Triomphe and then produce her own winner of the world wide prestigious race. She was also victorious in the Prix Exbury, Prix d’Harcourt, Prix Gontaut Biron and three other listed stakes races. Her victory in the 1993 Arc was the crowning achievement in her racing career that would see her travel the globe. She raced in places like Sha Tin in Hong Kong, Woodbine in Toronto, Ascot in Berkshire, Tokyo Racecourse, Dusseldorf Racecourse, Santa Anita in California as well as various French racing centres. Her best finishes in all of these excursions outside of France was a second in the E. P. Taylor Stakes at Woodbine, and a third in the German 1000 Guineas in Dusseldorf. Retired following a fourth place finish in the Coronation Cup at Epsom after sustaining an injured fetlock, Urban Sea was sent to Ireland and David Tsui’s broodmare band. Her first foal was a colt named Urban Ocean (Gallinule Stakes) by Bering. The following year she produced Melikah (Pretty Polly Stakes) by Lammtarra. Melikah was sold as a yearling by Tsui at the Deauville yearling sales for 1,500,000 Euros. Melikah later became the dam of Masterstroke by Monsun (Grand Prix de Deauville, third in the Arc), and the grand dam of stakes winners Vancouverite and Khawlah (UAE Derby and UAE Oaks). The third foal from Urban Sea was the phenomenal Galileo by Sadler’s Wells. Galileo became the first of two Epsom Derby winners produced by Urban Sea. Galileo’s Derby victory was the third fastest in history at the time. The racing résumé also includes victory in the Irish Derby and King George VI and Queen Elizabeth Stakes. He showed great tactical speed and had the stoutness to compete of a distance of ground, which was the hallmark of his dam Urban Sea. Furthermore, he has successfully passed on his many attributes and class beyond even the wildest hopes of his connections. Galileo is, in this writer’s opinion, the leading sire currently plying his trade in Thoroughbred breeding. Galileo has sired among others the incomparable superstar Frankel, and that one’s champion full brother Noble Mission as well as Epsom Derby winners New Approach, Ruler Of The World and Australia. Australia also won the Irish Derby, joining fellow Galileo sons Treasure Beach, Soldier Of Fortune and Cape Blanco, the latter being the winner of five grade/group one stakes races. Further classic winners include Roderic O’Connor (Irish 2000 Guineas), Golden Lilac (Prix de Diane, Poule d’Essai des Pouliches), Intello (Prix du Jockey Club), Great Heavens (Irish Oaks), multi grade one winner Night Time (Irish 2000 Guineas), Was (Epsom Oaks), St. Leger winners Sixties Icon and Order Of St. George, Gleneagles (English and Irish 2000 Guineas), Alegretto (Prix Royal-Oak), Minding (1000 Guineas), The Gurkha (Poule d’Essai des Pouliches) and Magician (Irish 2000 Guineas). The later also won the Breeder`s Cup Turf as did Red Rocks and Found. Galileo has been the leading sire in Europe seven times, including the last six years consecutive. He has emerged as a formidable broodmare sire with the likes of classic winners Night Of Thunder, Qualify, Magicool, Galileo Gold and La Cressonniere produced by daughters of this great sire. At the current rate of stakes winners Galileo is siring, he should surpass his illustrious sire Sadler’s Wells before he is finished. Fourth foal, and fourth stakes winner, from Urban Sea is Black Sam Bellamy, a full brother to Galileo. Black Sam Bellamy would win the Gran Premio del Jockey Club, the Tattersall’s Gold Cup and the Alleged Stakes, with second place finishes in the Grosser Pries von Baden and Prix Hocquart, and third in the Coronation Cup. Black Sam Bellamy began his sire career in Germany, but is now at Shade Oak Stud in England. He has had limited success so far. Foal number five is another colt by Sadler’s Wells named Atticus, foaled in the year 2000. There is some confusion here as there is another Thoroughbred named Atticus by Nureyev, foaled in 1992, currently standing at Magali Farms in California. The 1992 Atticus (Oaklawn Handicap) has sired thirty stakes winners. The 2000 Atticus, a full brother to the great sire Galileo, proved to be sterile. Urban Sea would have one more foal by Sadler’s Wells the following year, a filly this time, named All To Beautiful. All To Beautiful won two stakes races, the Salsabil Stakes and the Middleton Stakes and was second to Ouija Board in the Epsom Oaks. She is the dam of Cheshire Oaks winner Wonder Of Wonders. 2002 was the year when Urban Sea produced My Typhoon by Giant’s Causeway. Purchased for the lofty sum of 1.8 million pounds at the Tattersall’s sales, My Typhoon became the only offspring of her dam to race exclusively in the US. She won eight stakes races, the most prestigious prize being the grade one Diana Stakes. Every year up to this point since Urban Sea had been retired to the breeding arena, she had never missed bearing a foal. In 2003 she would be barren for the first time, and then resumed her production with her eighth foal the following year, a bay filly by Green Desert named Cherry Hinton. Cherry Hinton was only stakes placed in her racing career from five starts. She has however produced stakes winning fillies Wading and Irish Oaks winner Bracelet by Montjeu. A full brother to Cherry Hinton bred the following year named Sea’s Legacy went unraced. Urban Sea was bred to a son of Green Desert for the following season and the resulting colt became her second Epsom Derby winner, Sea The Stars by Cape Cross. Sea The Stars began his racing career as a two year old with a fourth place finish at the Curragh. As it would turn out this was the only race he did not win. He won his next race, at Leopardstown and then the Beresford Stakes at the Curragh. John Oxx, his trainer put Sea The Stars away for the rest of the season to prepare for the upcoming three year old campaign. The 2000 Guineas would be his first race as a three year old, winning by a length in impressive fashion. The Derby was next and Sea The Stars would take this most prestigious of races in a calm easy manner, assuming the lead with a furlong to go, and stretching out for a comfortable victory over Fame And Glory. He was to run in the Irish Derby, but the course conditions came up unsuitable, hence he was scratched. He next appeared a week later at Sandown Park for the ten furlong Eclipse Stakes, winning by one and one half lengths over Conduit, the then reigning Breeder’s Cup Turf winner. Now three for three as a three year old, all group one races, Sea The Stars started in the ten and one half furlong International Stakes at York. He won again, defeating four time group one winner Mastercraftsman by a length. Leopardstown was Sea The Stars next destination, and a start in the Irish Champion Stakes facing the Irish Derby winner Fame And Glory as well as Mastercraftsman. A two and one half lengths victory for Sea The Stars was the official result, Fame And Glory second, Mastercraftsman another two lengths back in third. October 4, 2009 would be the day of his final, and perhaps most impressive victory. Sea The Stars faced a field of eighteen other entrants at Longchamps for the seventy-seventh running of the Prix de l’Arc de Triomphe. In the field were eight other group one winners as well as Sea The Stars. The entrants included old rivals Fame And Glory and Conduit, as well as Stacelita, Dar Re Mi and Cavalryman. Sea The Stars was boxed in with three furlongs to go but, jockey Michael Kinane found a hole and asked Sea The Stars to go through, which he did in a flash. The son of Urban Sea began pulling away by three lengths, eventually winning by a very comfortable two lengths as he was easing up at the finish. Sea The Stars had just won his sixth straight group one race in six months, and in winning the Arc he made his dam one of the rare winners of this prestigious race to produce a winner herself. At year’s end he was given a 140 pound rating by Timeform in honour of his efforts. This is the eighth highest rating in the long history of the turf. Sea The Stars was retired from racing and entered stud in 2010 at Gilltown Stud in Ireland, owned by the Aga Khan IV. To date Sea The Stars has been nothing short of sensational in his second career. This year’s dual Derby winner Harzand (Epsom and Irish Derbies) is bred and campaigned by the Aga Khan IV. Harzand is from the third crop of foals sired By Sea The Stars. From his first crop came Deutsches Derby winner Sea The Moon, Epsom Oaks and King George VI and Queen Elizabeth Stakes winner Taghrooda, as well as Prix Saint-Alary winner Vazira. With only four crops old enough to race, Sea The Stars is currently in second place in the England/Ireland sire list, behind his half brother Galileo. Sea The Stars has made rapid advances up various sire lists in other top class racing jurisdictions and is currently advertised with a € 125,000 stud fee, to full books of high quality mares. In 2009 when Sea The Stars was sweeping all who challenged him on the race course, his dam Urban Sea produced one more colt. Sired by Invincible Spirit, another son of Green Desert, the colt’s name is Born To Sea. Although he was not to have as big a career as his half brothers Galileo and Sea The Stars, he would display the class of his family when he won the Blenheim Stakes at two, and then finished second to the outstanding Camelot in the Irish Derby at three. He is currently standing at Gilltown Stud beside his three quarter brother Sea The Stars, and is well supported. His first crop of foals are arriving at the races at time of writing. At the age of twenty, Urban Sea died shortly after she foaled Born To Sea, from the complications of haemorrhaging during the birth. Her passing was a deep blow to her connections and her handlers at the Irish National Stud were she was boarded. “Everybody at the stud is absolutely devastated” remarked stallion nominations manager Julie Lynch. She added “We were all immensely proud to be associated with her. A mare like her comes along once in a lifetime”. The Racing Post bloodstock writer Tony Morris said “She was the mare who answered back. She kept giving us reasons to remember her”. Urban Sea produced eleven foals, of which eight became stakes winners, four are grade/group one stakes winners, two became undisputed champions, and one additional filly was stakes placed and then produced stakes winners herself. This remarkable record of production is groundbreaking, but not without historical precedence. When Australia won the Epsom Derby and Taghrooda won the Epsom Oaks, no two sons of the same mare had sired winners of these classics in the same year since 1866. That was the year when the great broodmare Pocahontas’ sons Stockwell (Lord Lyon won the Derby) and King Tom (Tormentor won the Oaks) each sired a winner of these prestigious races. Both Stockwell and King Tom became pivotal stallions in breeding history. Urban Sea’s Galileo has already cemented his place in history and is not finished yet. Sea The Stars is showing all the signs of joining his sibling in the upper echelon of world class sires. Sometime within the next thirty years or so, someone will write a book about the family started by Urban Sea, and the litany of stakes winners and champions that descend from her. I know there are no guarantees in Thoroughbred breeding, but this is a prediction I feel very sure of. The ongoing legacy we are currently witnessing will demand such a volume. excellent and insightful article Colin. I dont thing we will see the likes of her again. Without a doubt, the best ever. Hi Colin, sorry that I haven’t been posting to you, but I’ve been very sick. I’ve been busy with doctor appointments, and extremely exhausted from my radiation treatments. I’ve lost 75 lbs, and am anemic, which causes an exhaustion, beyond words. You know I love your heartfelt stories, that bring these beautiful thoroughbreds to life. I was checking in on your site, and when I saw the title Queens of The Turf, I couldn’t wait to see wait to see what you had to say about Zenyatta. What a surprise, when I found nothing! Are you planning something special? She truly is a gift from heaven! I really enjoy reading your stories about the hreat mares in racing. I have learned so much from you. Keep up the great work and i look forward to reading what you write. As important as La Trioenne and Selene. Reading TDN – Europe and a filly by the name of Rainbow Heart caught my eye. I thought that maybe a Samson Farm progeny had shown up in Ireland but that wasn’t the case. What did catch my attention was the the mare Urban Sea is the dam of the sire, Born To Sea who I didn’t know of. My research now includes your insightful and in depth site plus equineline.com. Thanks!